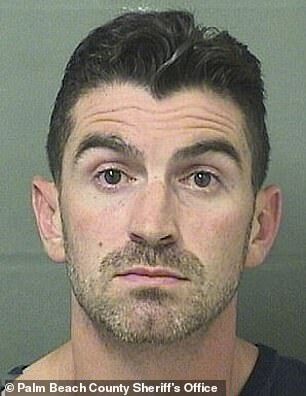 The mother was arrested after she drove to her son-in-law Michael Sciarra’s house, threw eggs and tried to run him over with her Mercedes after he told her daughter about their almost four-year affair. 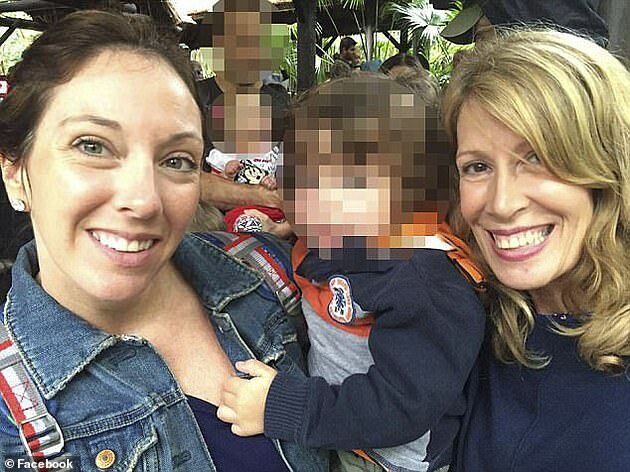 Davis, 59, said that Sciarra, 34, deserved to die for exposing their fling and ‘destroying’ her family. She also accused him of sexual assault, said he had been in dozens of adulterous relationships while married to her daughter, and said his father was in the mob. 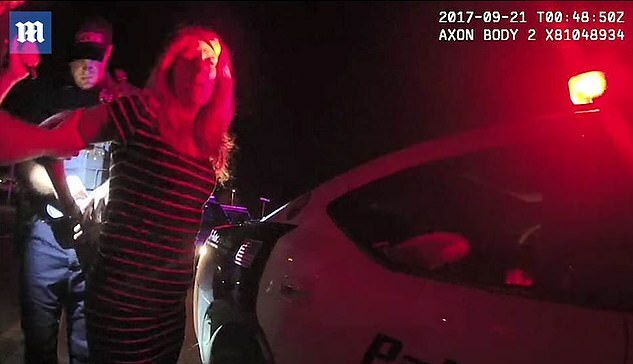 Her dramatic arrest and story to the cops was captured on dashcam footage from that night in September 2017, obtained by DailyMail.com through a public records request. At one point, as she is being led into the back of a patrol car, she said ‘hi’ to two of her grandsons, who were inside the house when she started throwing the eggs and donuts on the front lawn. Davis has since pleaded guilty to assault with a deadly weapon and was given three years probation. She was also ordered to stay away from Sciarra, take an anger management course, and abstain from drugs and alcohol. It’s not known if Davis’ relationship with her daughter has improved. Her lawyer told DailyMail.com she did not want to comment and her client did not want to be contacted for an interview. 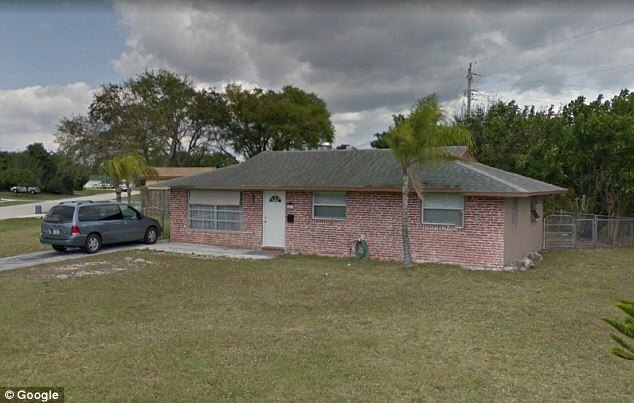 The confrontation began on September 20, 2017, when Davis reportedly drove to Sciarra’s Florida home, at 4429 Crestdale St and began throwing eggs at his house and car. Police were called and found Davis chasing Sciarra around his front yard, in her Mercedes SUV. 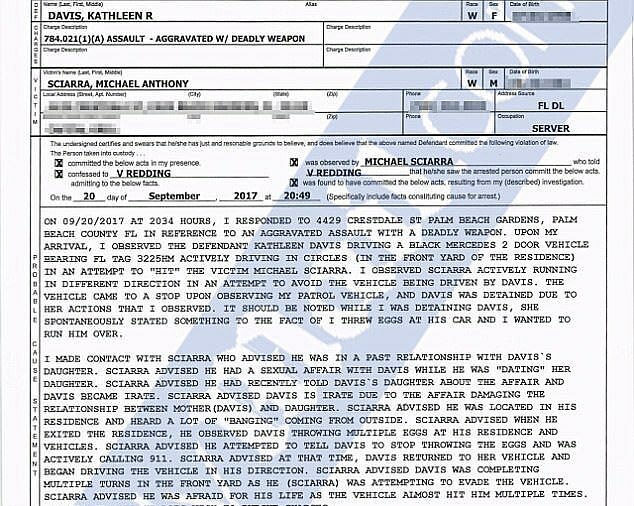 The officer also noted they observed him running in different directions in an attempt to avoid being hit by the Mercedes being driven by Davis. 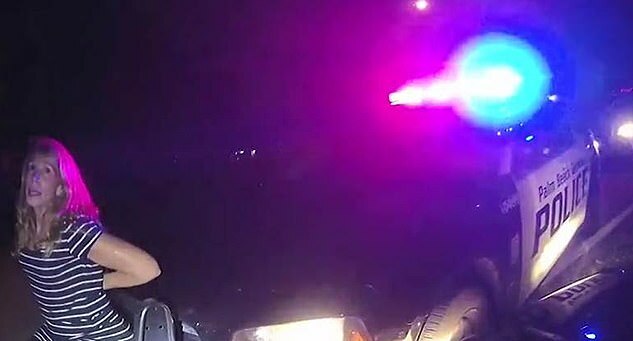 Dashcam footage shows the moment when one of the cops approached Davis, who was still revving the accelerator. He asked her to turn off the engine and get out of the car. ‘He abused me. He sexually assaulted me,’ she told the cop, while Sciarra laughed in the background. Davis then told officers: ‘He raped me and then he told my daughter that we were sleeping together for three and a half years. So I am pretty p***ed off’. ‘I tried to run him down with car. A cop then asks Davis if she wanted to kill him because he’s ‘making up lies’? ‘No he’s not making up lies. It’s true. I had a f***ing relationship with this guy’, she admitted. ‘Listen darling. He only did it so he could ruin my Hannah. He used me so he could get to her. ‘He has had 10 to 15 adulterous relationships in the last year. I am, like, beside myself. The officer then asked why she was trying to run him over, and Davis replied: ‘He deserves to die. The man has destroyed my family’. 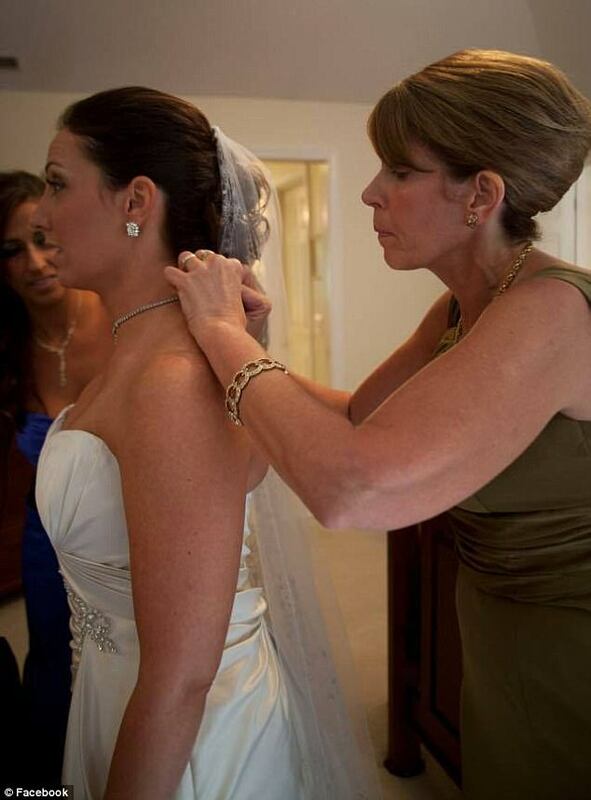 ‘This man is trying to destroy my life, my daughter, my husband. He accused me of having a sexual relationship that I didn’t have and he raped me in Rhode Island. ‘When he came out running, I wanted to kill him. I tapped his father’s car. If I wanted to total it, I would have. ‘I wanted to hit him. I wanted to kill him. Can you put me in jail for that? She then said she hit the police car on accident. The officer approached Sciarra who was standing next to his car inspecting the damage. The cop asked him: ‘You got home and you heard a bunch of banging and she was throwing eggs at the window? Sciarra responded: ‘Yeah. She was throwing it at me and at the cars. I also have video of her saying she is going to kill me as well. ‘Absolutely, I am going to press charges,’ he added, and then showed the cops the damage she did to his car. Meanwhile, Davis could be heard speaking to one of the officers. A cop asked why she went over to the house that night. He then goes on to say what had happened previously with his estranged wife Hannah – Davis’ daughter. From all accounts, in police reports also obtained by DailyMail.com, the relationship between Hannah and her husband Michael had been in steep decline in the months leading up to the incident. 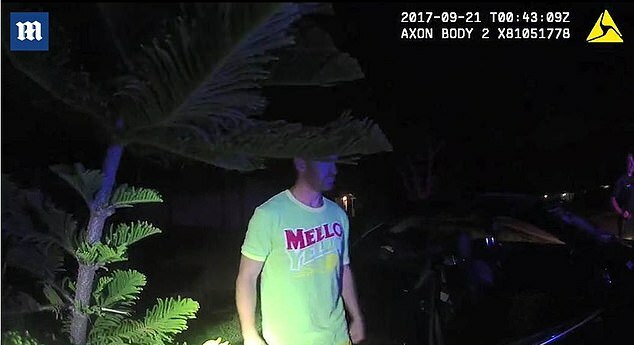 In May 2017, police responded to the same address where Hannah’s mother was arrested but this time for an incident involving Hannah and Michael after their neighbor called police when he said he heard Hannah screaming. According to police, Hannah said she was having family dinner with Michael and their two children, Andrew, two, and Gabriel, six, when her husband became agitated by the conversation in which she was telling him about an achievement at work. She told cops he ‘flipped out’ on her after the conversation turned to their issues and she disclosed that she was cheating on him with another man. Hannah told the police he struck her during the outburst. Police say when they entered the home it was covered with broken glass and items strewn about the home. Police say they both smelled like alcohol, and that Hannah was visibly upset and had a swollen eye. Michael had left their home before officers arrived, but returned after they spoke with him by telephone and asked him to come back to talk over what happened. He also got agitated by the conversation with police, and threw his hands behind his back telling the officers to arrest him – so they did. Michael admitted to the police that they did get into a verbal altercation after she told him she was seeing another man, but denied striking her. Police arrested him on the charge of domestic battery for the May incident. As Sciarra finished explaining how the relationship with his wife deteriorated, he showed off the damage done to his car. Another said: ‘I thought she was joking’. 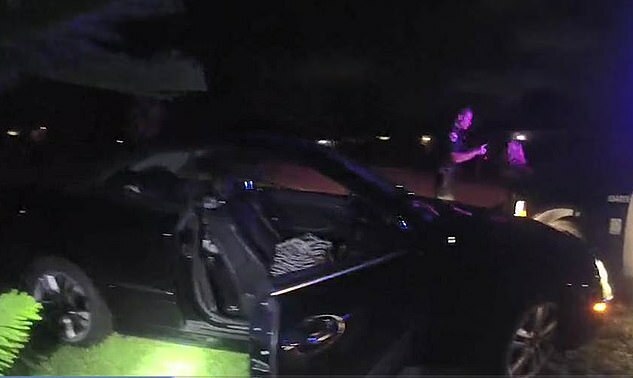 The bodycam then shows the front seat of her Mercedes, where the boxes of eggs she brought to throw at the house are stacked up. 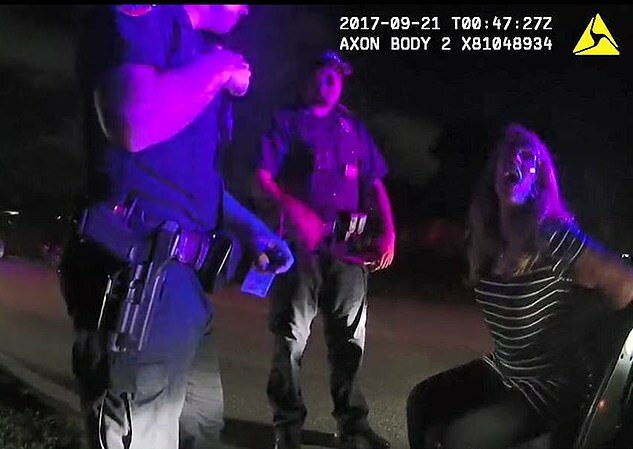 When cops arrive at jail with Davis, they tell her she will be booked in and then bonded out, and warned her not to return to the house until the whole case is sorted out. DailyMail.com has contacted Sciarra for comment.